There is a substantial cairn on the summit named Carnbower. 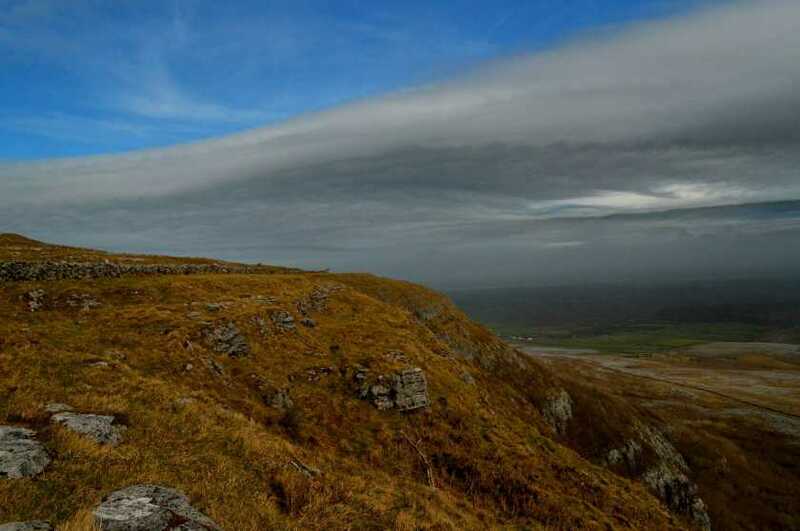 Slievecarran is the third highest hill in the West Clare area and the 1098th highest in Ireland. Park beside the gate and information board around M3304 0329 A. From here, head through the gate and along the track across the limestone pavement. You soon pass through another gate in a wall, from where you can head off the track up the hill to the left. Veer off to the obvious shoulder, left of the cliffs. Follow this up over steep, broken limestone ground, the trickiest part is early on, where you have to cross a large wall, amongst thick hazel scrub, on top of a 3m rock step. I bagged Slievecarran from the SW on Sunday January 29th 2012. Looking for a bit of a challenging loop walk on the map I decided to try a horseshoe walk traversing Gortaclare Mountain, Slievecarran and Turlough Hill. Parked the car at the Burren Outdoor Education Centre M28402 06087 B. While most of Ireland is in the rain today, it is a lovely mostly sunny afternoon in the Burren. I first aim for Gortaclare Mountain, so I start with 2 km road walk. I take the first road left. On the right side of this road is a scenic lake, which I can’t find back on the map. I guess this must be one of those turloughs which have only water in winter. Where the road takes a sharp bend to the west M28656 04028 C, I go straight on into a green road past some farm buildings. Follow this scenic road up in a general SE direction, ignoring two branches going north. The road has a few gates. One of them has the familiar sign informing me I am entering farm land and unauthorised access is not allowed. Shortly after this gate a 4WD comes up the road with high speed. I wait at the side of the road expecting my very first angry Irish farmer encounter. However it is a woman with her daughter and the dog. They drive up for a walk. When I ask about access she just says no worries and moves on. The green road passes close to a mass rock and then ends just below the summit area of Gortaclare Mountain. The actual summit is almost 2km NE, but you will be hard pushed to determine its exact location on the broad fairly level summit area. It’ is also very green here with grass, heather and a few hazel trees. Very unlike the bare Burren hills closer to the ocean. Not really easy going either on slippery grass over wet limestone and numerous hidden holes. 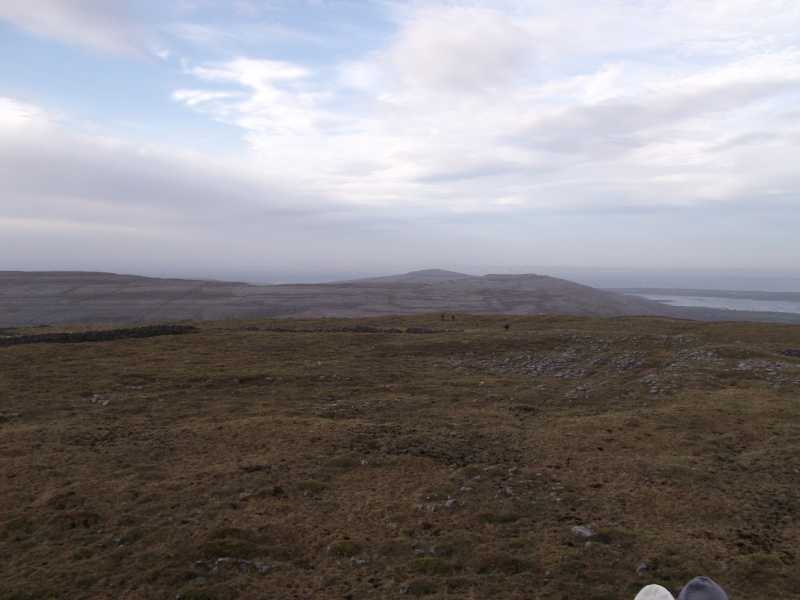 I continue on NE gradually rising up to the broad summit plateau of Slievecarran. The large summit cairn is at the north end of this plateau. After a short break, taking pictures and enjoying the view. I descend a cliff and head north for the saddle leading to the Turlough Hill ridge. Gradually there is a bit more limestone underfoot and the going gets easier. I follow a guide wall leading west in the direction of the summit cairn. From the summit I can see all the terrain I have negotiated so far this afternoon. 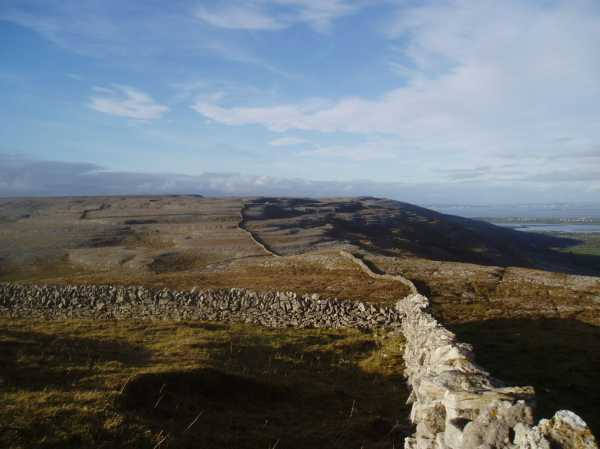 Also great views towards Galway Bay and the familiar Burren landmarks of Oughtmama, Abbey Hill, Moneen Mountain and Ailwee. After the summit, and negotiating another steep cliff, there remains not much more than to follow the wall down SW. At a height of around 120 m I head straight west, steep down towards a lane M28771 05850 D which leads back to the main road. 4.5 hours after departing, and with 15.5 kilometres underfoot, I arrive back at the car. A really fine walk with great views and a good variation of grass and limestone underfoot. Also, I had the hills to myself today only sharing with the cattle and the hares. I'm surprised Slievecarran hasn't been commented on already, seeing as its so prominent, interesting and accessible, so I'll give a quick rundown of some of its many charms. It may not be very tall or dramatic, but it catches the eye from lots of places around Galway city and Salthill, rising across the bay with its flat summit, prominent cairn and grey limestone sides. It also holds your attention when driving along the Galway to Gort road, being particularly enticing when the winter sun shines on its grey flanks. Its easy to climb Slievecarran from the nature reserve southwest of Kinvarra, just park beside the gate and information board around M3304 0329 A. 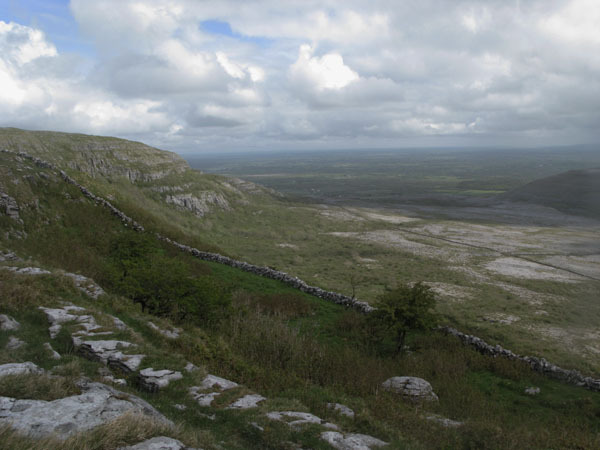 From here, head through the gate and along the track across the limestone pavement, where the typical Burren flora is present in abundance, especially in late April/May. 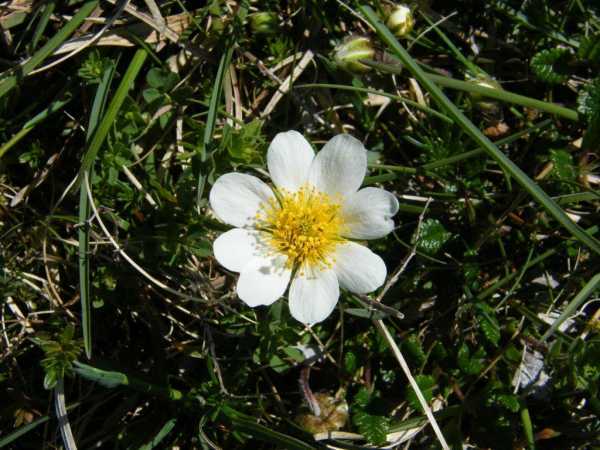 Among many others, you cant miss the cushions of Dryas octapetala, the mountain avens, with its white flowers, prominent yellow stamens and lobed leaves. You soon pass through another gate in a wall, from where you can head off the track up the hill to the left. However, a trip to the ruined church and holy well is not to be missed, so follow the path onwards, under the cliffs of Slievecarran, where eagles apparently once nested. The ruins of the church and its attendant holy well (at M3286 0425 E) are located in a delightful area of hazel woodland, there's also a small cave just up the hill.